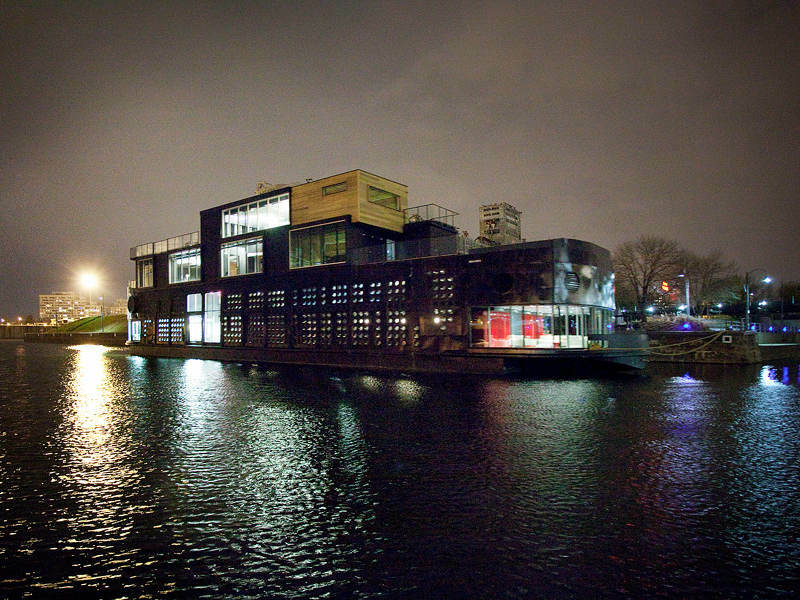 A 1950's ferryboat in Montreal has found a new life as a floating spa called Bota Bota. The famous ferryboat, which once transported passengers across the river, was the world's first traveling Art Center during Expo 67 in Montreal. 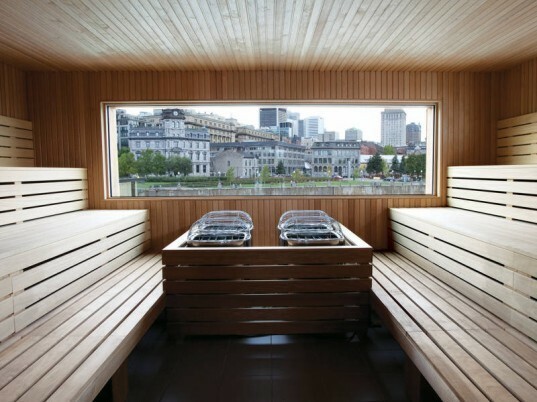 After two years of renovation and redesign by Sid Lee, the famous boat has been transformed into a floating spa where guests can receive relaxing treatments and take in the sights of Montreal's old port. The ferryboat, originally named the Arthur Cardin, was built in 1951 and carried people to and from Sorel and Berthier. In 1967, the boat was reborn as a traveling theater and art center for the World Expo in Montreal and it included a theater, foyers on three floors, bars, a restaurant, cabins for staff, and dressing rooms for actors. L’Escale proudly plied the waters in front of the famous Habitat 67 and enchanted thousands with its floating arts. After time and disuse, the boat was again resurrected — this time as a Bota Bota, a floating spa located at the foot of rue McGill in the old port of Montreal. The boat had sustained considerable damage to its hull and it took two years of renovations on dry land to transform the former ferryboat/theater into a relaxing guest spa. As the spa would only float and not travel along the waters, the engines were removed to make way for guest locker rooms, and additional infrastructure was added for treatment rooms, pools, offices, a cafe, relaxation lounges and more. Rooms located in the lower decks are kept dark and tranquil to provide guests with a secluded and quiet space for relaxation. As guests travel closer to the top deck, the spaces open up with more light with a greater connection to nature and the surrounding waters. Over 650 porthole windows were added via prefab metal panels in many places to provide more light as well as texture to the boat. The boat now stands stationary in the water, no longer running on dirty and polluting diesel engines. Hooked to shore-tied grid energy, the boat runs much more efficiently and utilizes a geothermal heat pump to increase energy efficiency. An open geothermal loop in a reservoir next to the boat uses the relatively constant temperature of the water to aid in heating and cooling. Visitors to the floating spa must first cross over Quai des éclusiers and the train bridge and enter the classic style garden, which stands in stark contrast to the industrial landscape of the Old Port. Rooms located in the lower decks are kept dark and tranquil to provide guests with a secluded and quiet space for relaxation. As guests travel closer to the top deck, the spaces open up with more light with a greater connection to nature and the surrounding waters. The ferryboat, originally named the Arthur Cardin, was built in 1951 and carried people to and from Sorel and Berthier. Visitors to the floating spa must first cross over Quai des éclusiers and the train bridge and enter the classic style garden, which stands in stark contrast to the industrial landscape of the old port. 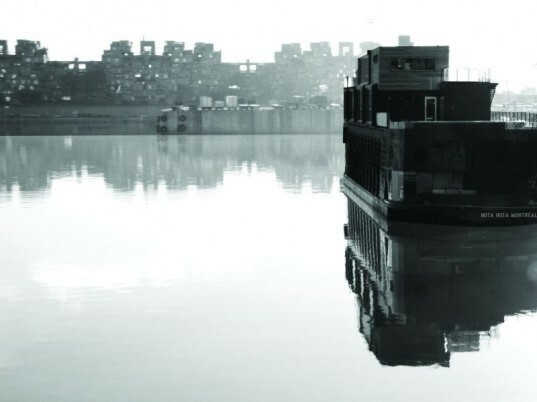 In 1967, the boat was reborn as a traveling theater and art center for the World Expo in Montreal and it included a theater, foyers on three floors, bars, a restaurant, cabins for staff, and dressing rooms for actors. L'Escale proudly plied the waters in front of the famous Habitat 67 and enchanted thousands with its floating arts. You can see Habitat 67 clearly in the background of the lead image. After time and disuse, the boat was again resurrected -- this time as a Bota Bota, a floating spa located at the foot of rue McGill in the old port of Montreal. The boat had sustained considerable damage to its hull and it took two years of renovations on dry land to transform the former ferryboat/theater into a relaxing guest spa. As the spa would only float and not travel along the waters, the engines were removed to make way for guest locker rooms, and additional infrastructure was added for treatment rooms, pools, offices, a cafe, relaxation lounges and more. The dark and light color motif was specifically designed to put guests into a different state of mind while in the spa. Over 650 porthole windows were added via prefab metal panels to provide more light as well as texture to the boat. From the exterior the portholes provide a dramatic and modern texture to the otherwise smooth and historic exterior. The boat now stands stationary in the water, no longer running dirty and polluting diesel engines. Hooked up to shore-tied grid energy, the boat runs much more efficiently and utilizes a geothermal heat pump to increase energy efficiency. An open geothermal loop in a reservoir next to the boat uses the relatively constant temperature of the water to aid in heating and cooling. A locker room in the hull takes the place of the former engine room. The famous theatre boat, L'Escale, before renovations began. The boat was taken out of the water first to repair damages to the hull and then put back in the water to complete the renovations. The renovation added a couple of levels to provide more floor space to the boat, and everything was designed to be as light weight as possible. The boat floats but no longer can move on its own power, as the engines were removed to make way for spa space.